We perceive color just as we perceive taste. When we eat, our taste buds sense four attributes: sweet, salty, sour, and bitter. Point at the foods below to discover their unique taste attributes. Similarly, when we look at a scene, our visual nerves register color in terms of the attributes of color: the amount of green-or-red; the amount of blue-or-yellow; and the brightness. To see how colors are registered in terms of the attributes of color, point at the painting by Renoir below. Note that these attributes are opposites, like hot and cold. Color nerves sense green or red — but never both; and blue or yellow — but never both. Thus, we never see bluish-yellows or reddish-greens. The opposition of these colors forms the basis of color vision. These three dimensions, “green or red,” “blue or yellow,” and brightness, form the foundation for the way our brain perceives color. There are many other mathematical representations of 3D color, such as RGB, CMYK, LAB, HSV, HSL and NCS, all of which are available in the ColoRotate sliders. Often, we adjust colors by looking at only a slice of 3D color space. The artistic term “hue” is the cross section of color space; “saturation” represents where the color is placed between the grey middle and the colored edge; “value,” also called “brightness” or “luminance,” is the intensity of the color and is the third attribute. With ColoRotate, you can easily adjust hue and saturation by clicking the “HUE” button, or adjust the saturation and brightness by clicking the “TINT” button. Color is a micro-consciousness – one that began as an elementary survival skill and that has evolved into an aesthetic that allows us to appreciate the startling beauty of both a rainbow and a Seurat pointillist painting. Like our senses of taste and smell, color helps us to understand the world around us. In the late 19th and early 20th centuries, many artists explored the “essence” of things, and they divided the visual experience into components, such as “color” and “form,” in a manner surprisingly similar to the way in which our brain processes information. Color tells us whether strawberries are ripe, and sets the mood in paintings. 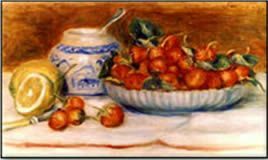 “Strawberries” (c.1905) by Pierre-Auguste Renoir. 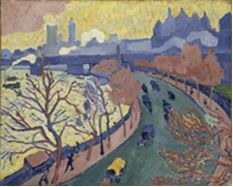 Fauve painters sought to “liberate” colors by investing objects with atypical colors, as in André Derain’s Charing Cross Bridge, London, (1906). The Fauvist painters of the early 20th century embraced this separation of the visual experience, shunning the precept that “color follows form.” Instead, they used non-representational color to depict recognizable subjects. Their success came from an understanding of late 19th century color theory, in that the hues of the colors were “wrong,” but the brightness of the colors was correct. 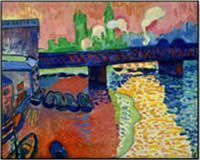 André Derain, “Charing Cross Bridge also known as Westminster Bridge,” 1906. This is another view of the same scene above, and with muted colors. Although Derain’s subtle colors are false, the painting conveys a tangible feel and mood. The vehicles are fast. The sky is partly cloudy. Our mind continually seizes essential information from the rapidly changing images we see, distilling from the successive views the essential character of objects and situations. Jacques Riviere, the art critic, wrote, “The true purpose of painting is to represent objects as they really are, that is to say differently from the way we see them.” Neurologists agree with his point: the function of the visual brain is to represent objects as they really are, rather than to solely rely on the raw data that streams into our eyes. Like the Fauvists, you can more comfortably, creatively, and effectively work with color by understanding how our brains process color. And, by using ColoRotate, you have more control over the various aspects of color in a way that mirrors how our minds actually perceive colors. Read more about how we perceive color.